Several Ethereum price predictions see the nascent cryptocurrency reaching $500 by the end of 2017, regardless of the current pullback. 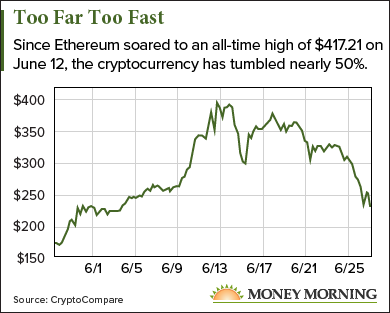 Yesterday (Monday), the price of Ethereum sunk as low as $209.55 on the CryptoCompare index, a 49.77% drop from the all-time high of $417.21 set on June 12. Ethereum, a digital currency cousin to the better-known Bitcoin, attracted investor attention this year as it skyrocketed as much as 5,000%. On Jan. 1, the price of Ethereum was just $7.98. At this point, an Ethereum price forecast of $500 may look like wishful thinking. But investors can't get distracted by the short-term volatility, no matter the severity. Bitcoin has already taught us that dramatic price gyrations come with the territory. Plus, the Bitcoin price history has also shown that steep drops are, sooner or later, followed by a full recovery and a climb to new highs. Last year the price of Ethereum rose as high as $21 before a major Ethereum-based project, the DAO (Decentralized Autonomous Organization) was hacked, putting as much as $60 million worth of invested funds at risk. While the Ethereum Foundation created a "fork," a new version of Ethereum to counter the hack, the damage to Ethereum's reputation resulted in an extended price decline to about $7 – a drop of 67%. But in January 2017, the Ethereum price reversed course. It blew past last year's all-time high in March and then accelerated. Anyone who threw in the towel last fall missed out on huge gains. The current correction in the price of Ethereum is just that – a correction. Clearly, a 5,000% gain in five months was excessive, even for a cryptocurrency with as much promise as Ethereum. Don't forget that, even with the dramatic fall in the price of Ethereum this week, the cryptocurrency is still up more than 29% over the past month. And even with all the volatility, the underlying case for larger long-term gains hasn't changed, just as with Bitcoin. Significant price drops are opportunities to buy at a discount before the next big rally. Going by the Ethereum price prediction of $500 by the end of the year, that rally is just around the corner. An Ethereum price of $500 represents a doubling from the current price of about $250 (as of midday Tuesday).